Audio Klan is a family owned company founded in 1994, starting as a small specialized hi-fi store, located in the downtown of Warsaw. In the early days the company was focused at import of British hi-fi and high-end products. These were offered through the own store, but also supplied to some number of specialized retailers from other cities of Poland. The product offer that time was relatively narrow, but precisely adjusted to the actual needs of music enthusiasts, so the store and the product offer soon gained popularity within Polish audiophiles. Through the nineties, the portfolio of distributed brands and offered product categories has been consequently broadened to cover wider segment of the hi-fi market and fulfill needs of increasing number of customers. Through these years we have also developed the retail part of the business, opening several new stores and creating a chain under name Top Hi-Fi. Start of the new century was a turning point for the company, as in year 2000 we became the exclusive distributor of Yamaha audio-video products, entering the new promising fields of Polish AV market. Taking these good chances we continued our dynamic growth, becoming an attractive distribution partner for quite a number of best hi-fi brands in the business, so early 2000’s brought us such legendary names as Bowers & Wilkins, Classe or Rotel. At the same time, we continued with new openings of Top Hi-Fi stores, transforming their name to Top Hi-Fi & Video Design. Nowadays, after over 20 years of continued success, Audio Klan represents quite a significant part of Polish hi-fi & AV market, offering broad portfolio of quality products, effectively distributed through all main sales channels of the country. Clear market strategy combined to deep knowledge & long time experience, professional sales forces and solid financial resources, ensure further stable development of the company for long decades to come. We all know that it is the people that make the companies grow. Human resources have always been a great focus of Audio Klan, as people’s knowledge, experience & skills - they all contribute to the success. Being a family owned company, the firm has created some special kind of team atmosphere & good internal relations, which benefit in very stable employment and long professional experience of the staff members. But there’s one more thing that makes us unique. It’s the passion that created Audio Klan over 20 years ago and it’s still shared by the members of our team. The passion for music, its purity and joy of listening. We are different personalities of a different age and different experience, but it was the music that’s gathered us here together, creating a professional team of sound enthusiasts. We deeply believe this passion is being shared by our customers, who love music as much as we do, and this is why the company is so well tuned to their needs and expectations. With over 20 years of continued effort, strategic decisions that proved to be right, carefully selected product portfolio, highly competent team of professionals and leading position in the market, surely we can talk about the success in a business sense. Our distribution offer covers wide variety of quality products starting from accessories and cables, through personal audio and wireless zone solutions, up to hi-fi components, home cinema separates and high-end electronics & speaker systems. Such wealth of brands and product categories, matched to long years of experience, professional sales forces and good business relations with key retail market players & a number of independent dealers, assure us very strong and stable position within AV business in Poland, achieving great market shares for the distribution brands. Also, the retail part of our business takes very significant position in the market, being the largest countrywide chain of specialized hi-fi & high-end stores in Poland. Started in mid 90’s, Top Hi-Fi & Video Design stores have become a meaningful part of Polish hi-fi history, being a place close to the hearts of numerous audiophiles and music fans. 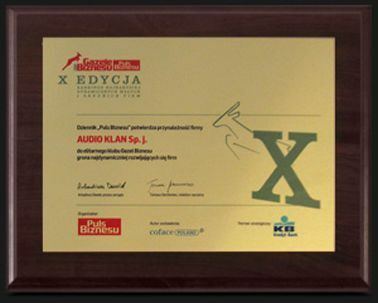 The best qualities of Audio Klan operations are being proved each year with numerous thousands of products sold to satisfied customers, but also by business professionals who have rewarded us with Business Gazelle prize for the most developing small & medium business in Poland. OUR MISSION HAS REMAINED UNCHANGED SINCE WE STARTED BACK in MID NINETIES. WE AIM AT DELIVERING MUSIC LOVERS THE BEST SOUND QUALITY AND TRUE VALUE FOR MONEY, as THEIR SATISFACTION HAS ALWAYS BEEN OUR TOP PRIORITY. OUR PASSION FOR MUSIC is THE MAIN DRIVING FORCE THAT KEeps MOTIVATING US IN OUR CONTINUED SEARCH OF BETTER SOUND AND THE PRODUCTS PERFECTLY MATCHING THE NEEDS OF OUR CUSTOMERS. NOWADAYS, AFTER 20 YEARS OF MARKET ACTIVITY, AUDIO KLAN IS NOT only A HIGHLY REGARDED DISTRIBUTOR OF QUALITY SOLUTIONs in hi-fi, high-end, HOME AV ENTERTAINMENT And personal audio, but also the owner of well known chain of twelve “top hi-fi & video design” specialized stores that offer a great selection of high quality products, providing professional advice and excellent environment for experiencing sound capabilities of the equipment. of course we never stop our quest for perfect sound and the best products. our mission and admiration for music make audio klan a kind of unique in the market, offering not only the great audio solutions, but also sharing its passions with music fans and audiophiles.